Conceived as a hotel with the spirit of a hostel - communal, inspiring, and inviting – the Freehand Los Angeles is Roman and Williams' third Freehand creation. In line with this philosophy, Freehand LA was dreamed as a space where travelers could converge to share ideas, stories and dreams; inspired by a community that forges its own path. Roman and Williams collaborated on all aspects of the creation of Freehand, including the naming, branding, and its concept built upon a "free to be you and me" credo. For all things food and beverage, Roman and Williams joined forces once again with Bar Lab to create The Exchange and Rudolph’s Tea and Bar room at The Freehand Los Angeles. The two are fixtures of the lobby, easily accessible to walk-ins and guests. The cuisine is Israeli-focused, led by Angeleno Chef Alex Chang, while Rudolph’s Tea and Bar (its namesake honoring the the former building owner, Rudolph Rosenberg) serves a fresh variety of tea-infused cocktails and vintage spirits. A natural palette is found throughout, with brilliant and intense secondary colors contrasting with deep teal, golds and oranges, a combination that is invigorating and natural. Other standout details in the Freehand LA restaurant include custom muslin fabric and wooden light fixtures that were inspired by large kites. Floating as though they are in the sky, the lights are glowing 24 x 26 inch structures. The soaring two story space required a solution to inhabit its volume, and Roman and Williams embraced a natural palette and story, imagining that the room could inspire the experience of being outdoors. 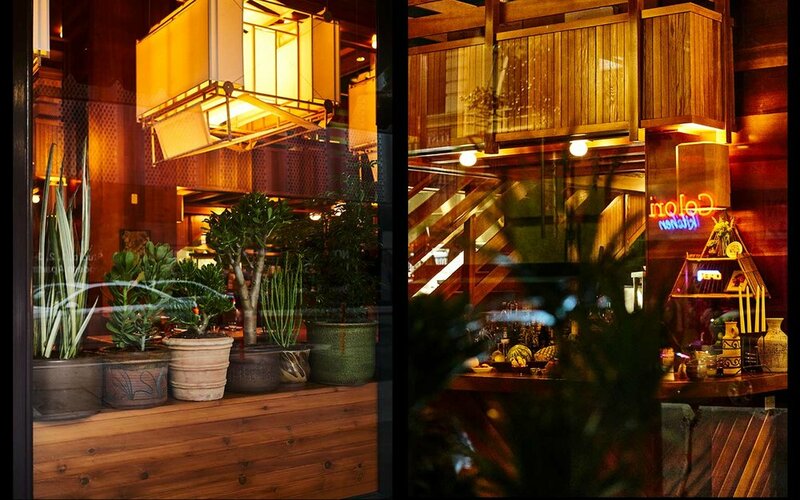 Plants and terrariums are tucked throughout the adjoining restaurant in a nod to California’s surrounding desert and mountains.